Slam The Brakes On Road Rage! Learn to put your road rage in park with these tips. Driving can be frustrating. We all know the feeling of our shoulders slowly tensing as we sit in gridlocked traffic, or our pulse pounding after we have to slam on the brakes when an inconsiderate or careless driver cuts us off. If these sound like feelings you get every time you’re behind the wheel, though, you probably have a case of road rage. 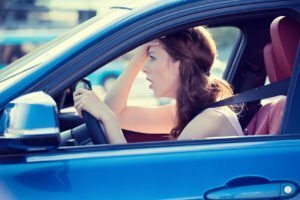 Learn to control your aggressive driving with these tips. Leave your house well before you think you need to. If you have extra travel time, a slow driver or a traffic jam won’t be nearly as frustrating! If you’re having trouble getting out the door in time, turn your clocks ahead. Find something you like to do in the car, like listening to a good book on tape or your favorite album, and focus on that instead of the drivers around you. Learn breathing exercises to practice when you’re feeling frustrated. Learning to control your road rage won’t just keep you calmer on the road, it will also help you avoid an accident. That, in turn, will help you save on your Texas auto insurance coverage! To learn more about how a good driving record can offer you discounts, contact Pierce Insurance Group in McKinney today.